The stock market is in the midst of a roller coaster ride during the past few weeks with stomach churning down moves that have been encouraging the bears to once more call an end to the bull market backed by supporting reasons coalescing around expectations for the U.S. Fed is to bring QE to an end and signal that interest rate hikes just around the corner. Then there’s China economic weakness, a European recession, ISIS and not forgetting EBOLA! So plenty of doom for the bears to play pick and mix with for reasons why End Time is here! 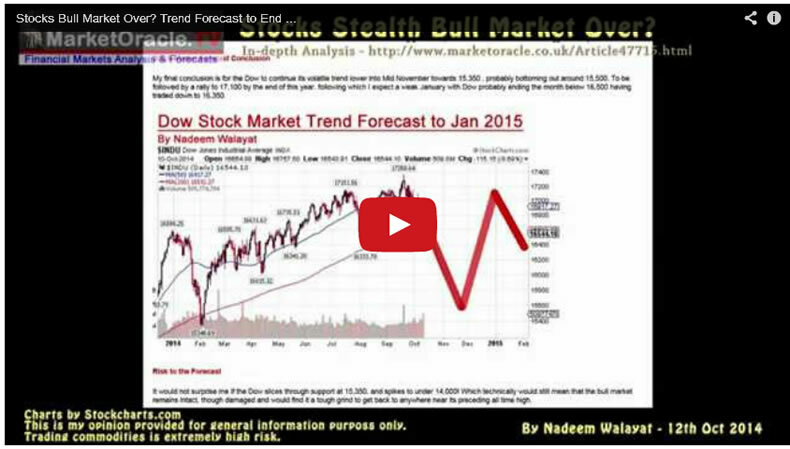 This video based on in depth analysis (http://www.marketoracle.co.uk/Article47715.html) which concludes in a detailed trend forecast into the end of January 2015.